The Fast Ford formula is alive and well in the Focus ST: everyday usability meets serious performance at an affordable price. Replacing the notoriously thirsty five-cylinder 2.5-litre turbo motor of its predecessor with a smaller 2.0-litre, four-cylinder EcoBoost engine hasn’t just improved economy and emissions (on paper, at least) but given performance a useful shot in the arm as well. And in this facelifted car, those strengths still remain. There’s an entertaining chassis beneath the ST, with eager steering and good balance. But it’s also a car that some may quickly tire of, with no LSD to tame the 247bhp the ST puts to its front wheels, and a nose that seems to react to every camber and rut in the road. Driving the ST quickly then can be hard work on bumpy UK roads, not helped by a very firm ride. However, it’s hard to ignore the ST’s value, with more than enough performance to take the fight to the Volkswagen Golf GTI and Vauxhall Astra VXR, the appealing option of an estate version (something denied to most other hot hatchback buyers) and an amusingly throaty induction note thanks to Ford’s clever acoustics work. If you can put up with the torque steer and the slightly ropey cabin design, it’s a compelling performance option. 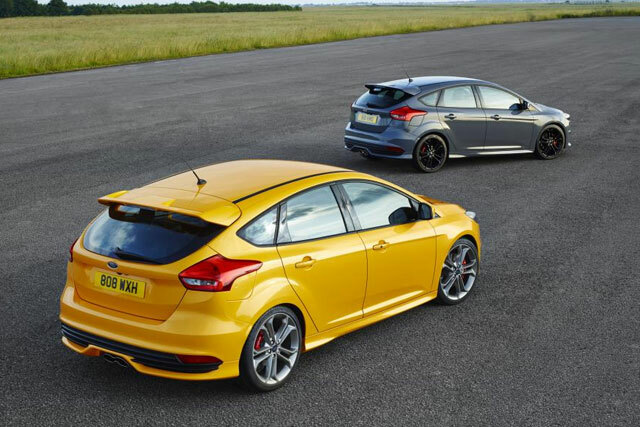 With 25bhp more power than its predecessor, the Focus ST sprints to 62mph in 6.5sec, matching the Volkswagen Golf GTI. The new 2-litre turbocharged engine develops 247bhp at 5500rpm. That’s complemented by a healthy 265lb ft of torque at just 2000rpm. The facelifted Focus car gets electric power-steering to sharpen its responses. It’s let down by an unyielding ride and significant torque steer and tramlining. Expect 25-30mpg in the real world from the petrol model, and 45-50mpg from the ST TDCi. The interior is brazenly sporting, with Recaro seats and carbonfibre trim. 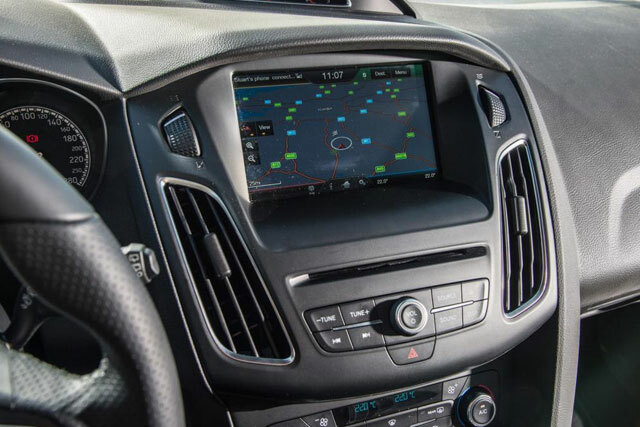 Ford offers a Driver Assistance pack that adds collision avoidance and lane keep assist. Ford’s facelift has tightened the Focus’s lines and done away with excess visual weight. 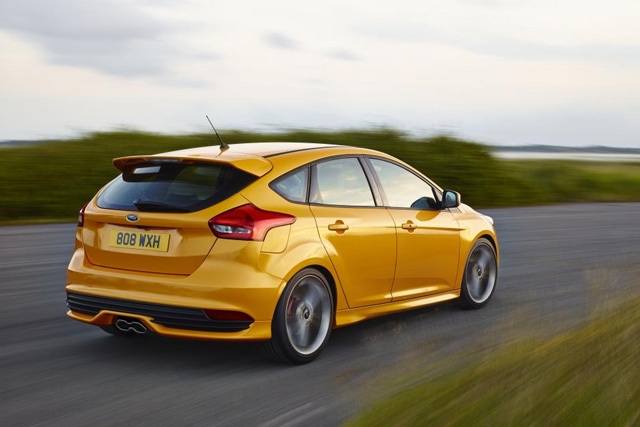 Read more about the Focus ST’s design here. The Ford Focus ST now starts at $16,775, which gets you the diesel model, while the petrol car is just $5 more expensive. That’s lower than any of the ST’s key rivals but not as low as it used to be – mainly because Ford has dropped the entry-level ST-1 (which few bought anyway – even at this stage in the market, buyers like their electronic gizmos and fancy trim) and the range now starts with the ST-2. Many head straight for the £27,145 ST-3, which covers the seats with full leather and also adds heating and electrical adjustment. You also get bi-xenon headlights and Ford’s latest SYNC2 infotainment system, though the latter isn’t an option we’d pay over the odds for. In estate form (£1100 more than the hatchback), we recently tested the ST TDCi against its diesel estate arch-rival, the Volkswagen Golf GTD Estate. It was a close contest and neither car is perfect, but it was the Focus that took victory on account of its more involving handling. The Volkswagen is the more refined of the pair too and while its styling isn’t quite as aggressive, its understated look might appeal more to some. The Focus diesel ST estate begins at £26,195, while the equivalent Golf GTD Estate starts at a considerable £28,770, so the Ford’s advantage is clear. A potential alternative is the Octavia vRS TDI, which makes the same power as the Golf but starts from £26,360. It’s available with all-wheel drive, too and would probably be our pick of the hot diesel estates. Of petrol options there’s currently plenty of choice, not least the car that still serves as a benchmark in this sector: the Volkswagen Golf GTI. Recently facelifted it now gets 227bhp as standard and offers a three-door option (£27,865) to the Focus-matching five-door (£28,520). It isn’t quite as exciting as the Ford, but it’s the better all-rounder – less unruly, still fun on the right kind of road, handsome inside and out and still indecently brisk. Also worth a look, just as it is with the estate models, is the less expensive Skoda Octavia v RS. It too has recently enjoyed a facelift, makes the same power as the Golf, and undercuts the Ford with a $16,775 price tag for a manual five-door.